A central tire inflation system (CTIS) is a system to provide control over the air pressure in each tire of a vehicle as a way to improve performance on different surfaces. For example, lowering the air pressure in a tire creates a larger area of contact between the tire and the ground and makes driving on softer ground much easier. It also does less damage to the surface. This is important on work sites and in agricultural fields. By giving the driver direct control over the air pressure in each tire, maneuverability is greatly improved. CTIS is extensively used in many off-road transport operations. In many countries, especially Australia, New Zealand and South Africa, CTIS is used in logging, in mining, and in power line maintenance. CTIS significantly reduces environmental impact when transporting logs, or travelling on gravel or dirt roads. Benefits include ironing out ruts and previous road damage, like washboards or corrugations. Reducing the tire pressure also reduces the grinding action on the gravel, significantly reducing dust and silt. CTIS also extends truck, tire, and drive train life, by significantly reducing vibration and shock loading. Feedback from Australian logging contractors show a doubling of transmission and differential life. Tire life can double, with drive tire life increasing from 27,000 km to 45,000 regularly shown . Even in flatter areas, drive tire life increased from 90,000 to 135,000 . There have been attempts at employing central tire inflation system on aircraft landing wheels (notably on the Soviet Antonov An-22 military transport) to improve their preparedness for unpaved runways. CTIS was first used in production on the American DUKW amphibious truck which was introduced in 1942. The Czech heavy military 8×8 truck Tatra T813‘s central inflation and deflation system was designed to maintain pressure even after multiple bullet punctures. 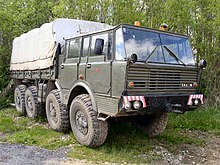 Military Tatra trucks are equipped with CTIS as standard. From 1984, GM offered CTIS for the Chevrolet Blazer and various pick-ups. Several trucks used by the U.S. military also have CTIS (e.g. the HMMWV and its civilian counterpart, the Hummer H1). The feature is also common in Soviet and Russian military trucks. “Central tire inflation system”. Retrieved 2010-05-13.